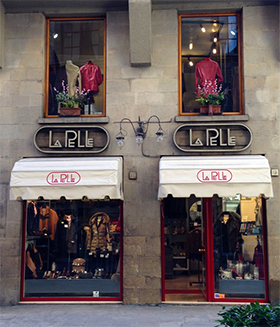 The leather garments of LA PELLE SRL are entirely made in Italy exclusively by Italian artisanal labor and mainly with Italian leathers. This guarantees high levels of quality, design and elegance that has always distinguished the Made in Italy in the world. Our garments are carefully made one by one, finished and checked in every detail by specialized personnel, in order to guarantee a perfect result. Since 1983 Aldo and Sonia offer large selection of man's and lady's clothing made of soft and fine quality leather by expert florentine artisans. We provide a prompt made-to-measure service and shipping all over the world. The store vaunts two floors where you find wide selection of original bags,shoes, belts and accessories made of precious skins as crocodile, python and ostrich. After thirty years, thanks to the skill and our courtesy, loyal customers come and visit our shop from all over the world.